Home » Diamonds Must Know! » How To Calculate the Worth of Your Diamond in Five Minutes! How To Calculate the Worth of Your Diamond in Five Minutes! How Much is My Diamond? If you ever went diamond shopping, you know that diamonds are not priced solely on the basis of their weight. Even if you dig deep, Price sheets such as the Rapaport will confuse and end ups costing you more money than the real price of a diamond. As a diamond is one of the most precious rocks on the planet, there are indeed myriads of nuances that go into the grading fineness in diamonds. Most of these were transparent or unknown as few decades ago, but today, the diamond price calculators are updated and improvised regularly. Depending on whether a diamond was born in a laboratory or ground as well its polish and glow, the price differs with different stones. Even though two differently weighed diamonds might look alike in weight, every diamond is distinct. Owing to the many parameters apart from the 4Cs that influence the Diamond Pricing, knowing characteristic of diamonds are important to make the perfect buy. In fact, the truth is that, if you understand the market value and characteristics that price a diamond, it is easy to find your dream treasure for a cost-efficient price! X= $5000X 0.7 or $3500. The rarity of a diamond influences the value of a diamond. However, this is not the sole restraint to the exuberant pricing of diamonds. Trend is another highly important characteristic of a diamond that hikes its cost at certain times. Nevertheless, the brilliance of a diamond is not decided by the carat weight alone, but many more virtues. In addition, there are many misconceptions as well as swindles that add to the higher price listing of world’s most precious gem! From colored to fluorescent diamonds, there are countless parameters that judge its billing price. Diamonds prices are influenced by market value, brand recognition and quality of diamonds. These parameters are scientifically analyzed for every diamond and the inferences constitute the disticn rate and rarity of the diamond. Depending on your State laws, local diamond markets and accessibility of conflict-free diamonds, the price of a diamond changes drastically. Used to determine the rate of light that enters and reflects from the diamond, the fiery brilliance of a diamond is inbuilt in the cut of the diamond. This influences the sparkling effect of the diamond, thereby its beauty and superlative brilliance. Popularly known as the faceting on a diamond, the excellence of every diamond in it cut. The pricing of a diamond dependent on its cut grades are Excellent is 15% > VG (Very Good) is 15% >G (Good), F (Fair) and P (Poor). The most important category of diamond pricing, cutting of a diamond is rated highest for Round diamonds, owing to its flawless shape. Marquise is the most expensive of all diamond fancy cuts while Square is priced the cheapest. One thing to lookout is that all diamonds lower than the VG grade will always have a lower rate as well as more flaws. Diamonds are made miles underneath the ground with high pressure and the same process of crystallization can sometimes lead to the inclusion of unwanted materials like blemishes. Today, the oily, milky or hazy look of a diamond is a blemish and is a heavy loss. The same is the reason why clarity is a costly parameter in diamonds. While transparent or flawless diamonds are priced high, the rate lowers with the rate of blurriness and noticeable inclusions. With respect to the Clarity grades- FL (Flawless), Internally Flawless (IF), Very Very Slightly Included (VVS1), Very Very Slightly Included (VVS2), Very Slightly Included (VS1), Very Slightly Included (VS2), Slightly Included (SI1), Slightly Included (SI2), Included (I1), Included (I2) and Included (I3). Simply put, the rate of how clean your diamond is, will determine is total value when observed under a 10 Power magnification. Sometimes, inclusions in a diamond are made to be invisible to the naked eye. If you’re dubious, make sure to get your diamond appraised by a GIA Gemologist. As the fundamental equation of diamond pricing states, the carat of a diamond is important in known the per carat value of any diamond. One carat is 100 parts with carat weights referred in decimal of ten’s places. An important pricing determinant of carat weight of a diamond is how perfect the weight itself is. Popularly known as magic weight in diamond terminology, the magic weight refers to a diamond with perfect figured sizes like- precise half or 2 carat weight and so on. The pricing of a one carat diamond is 25%- 30% more than that of 0.92 carat or so. Also a subjective option when choosing diamonds, size or carat weight of a diamond should be chosen with respect to one’s personality. The influence of color in diamond pricings is null and hence colorless diamonds are still priced higher than the colored diamonds. However, in case of rarities like Green, Blue and Red Diamonds, color plays an important role in spiking its price. In fact, even a slight difference or coloration of a diamond affects its price. The available color grades of a diamond are D to Z where D to F are colorless, G to J are Nearly Colorless, K to M as Faint, N to R as Very Light an S to Z as Lightly colored. In addition, sometimes market trends like the Pink Panther trend can increase the price of diamonds. Defined as how a diamond reacts to UV light, whether it emits a distinct hue of glow or haziness, is also used to determine the value of a diamond. Although fluorescent diamonds are priced lesser than non-fluorescent diamonds, rare fluorescence fetches high price too! For some diamonds that are hazy, the most common fluorescence- that of blue can neutralize the dirty hue and make the diamond whiter. In this case, for diamonds with the grade I and below colors, along with its lower clarity, using a blue fluorescence to enhance 15% different to its original shade is beneficial. While in diamonds of color grades D-F, fluorescence is a price lowering factor. Round shaped diamonds are noted as the most expensive diamonds while the fancy shaped diamonds are priced lower. The shapes like Radiant, Asscher, and Princess is costlier with Emerald, Pears and Ovals slightly lesser. The diamond shape of Marquise is noted as the second lowest priced shape with the lowest as Square shaped diamonds. Above all, the shape of a diamond is dependent on the trend and current fashion. While heart shaped diamonds can sell for high prices during Valentine’s Day, rounds are considered the most expensive shape at all times. Referring to the smoothness of how the facet of a diamond is cut and shaped, Polish determines the brilliance of a diamond. As diamonds are the hardest thing on the planet, polishing it also creates minuscule defects on the diamond, provided the cutter is a novice. As this creates dislodged crystals which tend to blur the reflection capacity of a diamond and hence, degrade its quality. There are five grades of Diamond Polishing- EX (Excellent), VG (Very Good), G (Good), F (Fair) and P (Poor). While excellent to good polish of diamond is the sign of high quality diamonds, poor quality of polish is appalling. Even though polish of a diamond impacts it lesser than the Cut grades, an EX Polished diamond is 7-10% better than a VG Polish of diamond. Depending on how the facet in any diamond is arranged without any uneven cuts on the diamond, symmetry of a diamond is determined. Proper symmetry of a diamond is important as poor symmetry will lead to poorly reflected brilliance of the diamond. There are five grades of Symmetry for a diamond- (Excellent), VG (Very Good), G (Good), F (Fair) and P (Poor). Symmetry of a diamond follows the same pricing parameters as the Polishing of a diamond. The easiest way to understand the value of a diamond is by getting it appraised by a certified gemologist. Inferring the true value of the diamonds 4Cs and all characteristics—the appraisal can be detailed with respect to the diamond prices as well as the ultimate evidence of the authenticity of the diamond. An appraisal or diamond certification helps to understand the right value of your diamond, its market value as well as insuring the same. Depending on whether your diamond is appraised, the re-sale value of the diamond is subject to increase. Also known as inclusions, not all diamonds in the market are 100% natural. Diamonds with flaws or inclusions are available at a cheap price and then fill it with fillers like silicone to fill it. These are sold at a cheaper price, but inclusions are observable solely under a 10X loupe, provided it is not severe. One such example of an online diamond jewelry trending with treated diamonds is Freddy Diamonds. Depending on the number of inclusions and the size of your diamond, treated or enhanced diamonds are rated less than 50% of the original price of a diamond. There is no magic formula to buy diamonds. The best way to get yourself a worthy rock is by analyzing and studying it. Get an appraisal of the diamond and cross-check if the above qualities of the diamond fits with your own demands. An important pricing fact about diamonds is its erratic pricing that changes from country to country as well jewelry stores in the same alley. If you have a recent past of visiting jewelries, you must have come across snobbish sales persons trying to explain the magnanimous discount you will make by buying instantly, all based on a Price Sheet. Usually, this printed sheet is the Rapaport Sheet, a sheet to analyze the maximum price of a diamond every week. The major flaw is that the final bill based on Rapaport Sheet shows the maximum value and not the best value of a diamond. If you’re not so much a Rapaport Person, the best way to stay within your budget and find the best buy for your money is to use the selection criterion on websites like James Allen or Blue Nile. These provide an exclusive tab for inputting your budget, choice of store, shape, carat, style and every other parameter that makes diamonds distinct. If you have the faintest knowledge of what Rapaport Sheet is, better take time and study it thorough before hurrying to weave your jewelry savings plan based on it. Published every week on Thursday midnight, the Rapaport Report gives the diamond prices based on the choice of carat weight and quality of the diamond. Created by Martin Rapaport, the report is a high cash price list of diamonds, usually the end sheet of the negotiations between diamond sellers and buyers. The Rapaport Report is sophisticated and brief way to understand is differentiating the carat weights with the price category. One can find the Rapaport Price of a diamond using the loose stone’s color, clarity and carat weight. All prices on the Rapaport Report are in 100s (dollars). IDEX is a clever alternative to Rapaport, which is a B2B diamond exchange. The Diamond Price Report on IDEX is also easy to use online. Yet another option is the many diamond price calculators such as the Diamond Retail Benchmark, which gives a high care diamond price list. The best way to get a diamond that sticks to your budget is by researching the maximum about the pricing of loose stones from different diamond geezers. Buying multiple small diamonds that are not the magic size or costliest shape as well as smartly blending blue fluorescence will help you reduce the maximum of diamond buying costs and find a smart engagement ring. Remember, it is not being cheap, but being smart! It is not just to say that diamond geezers can sell diamonds at ridiculous margins, depending on the demand. 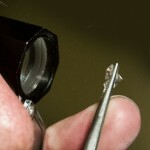 A brilliant way to save money on buying your diamond is by choosing a loose diamond prior to pronging. Jewelers price the total jewelry at higher rates when the diamond is in-built. If you choose a loose stone and then proceed to make your jewelry with the same, a couple of hundreds is a sure save! Make sure to ensure that the loose stone that you buy is real. An easy way to do this is appraising the same. Researching for diamond prices does not mean merely reading endless gemology mumbo jumbo. The best way to save your money is by finding a trustworthy and just diamond seller. As most diamond sellers today sell the precious rocks with huge opaque bills that often differs by thousands of dollars, in shop to shop. The erratic pricing of diamonds can be avoiding by reading reviews of jewelers, their affordability and layaway plans here on DPA easily. Another significant money loss is when you get an appraisal that comes within your diamond purchase. Most jewelers price their precious stones individually as a 10% lower price than with certified appraisals. Appraising on your own also ensures that the diamond geezer has not tricked you with fraudulent demands. A smart way to cut down your jewelry cost is by choosing a yellowish diamond with a strong blue fluorescence. Under UV rays in natural sunlight, you will notice that your diamond sparkles. As colored and fluorescent diamonds are cheaper than their non-glowing or colored counterparts, it is best to smartly blend both the negatives into a huge positive that matches you. Apart from the above another ingenious way save on diamonds is by choosing cheaper metals’ or settings for your jewelry. Visit online forums and articles that elaborate on the various methods that different brands use to value their diamonds. Including signature designs, collectible editions and brand status, the price of diamond sellers online remains diverse. Another exceptional parameter that affects the price of a diamond is its history. Provided the rock is an irreplaceable mark of history or with legendary lineage, diamond prices can hike.